What Kind Of Schooling Do You Need To Become A Plumber? Plumbers are in high demand and this industry will continue to grow. You can expect a stable career with great earning potential as a plumber. Some plumbers go on to earn as much as $70,000/year once they have gained experience in the field. Indeed, there are many opportunities for growth within the plumbing profession. If you are looking to get into the plumbing profession, here is how to succeed. Plumbing is considered a trade. In general, post-secondary education – typically in the form of a two-semester program (one academic year) – is necessary to become a licensed plumber. 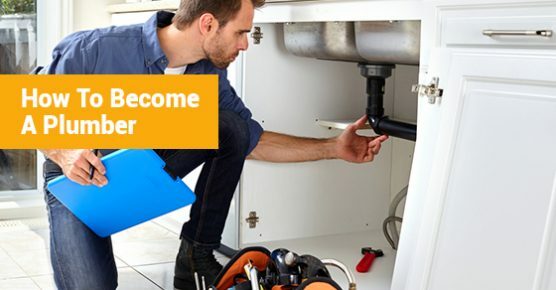 In order to become a licensed plumber, you will need to complete an apprenticeship, which is when you gather the skills needed to become a professional plumber while directly on the job. The benefit of this is that you will be paid for your time. In order to start an apprenticeship, however, you will have to get a sponsor, such as an employer, who is certified to take on apprentices. Some apprenticeship programs may require that you have at least one year of professional experience, but this can vary. In general, you will need to ensure that you are qualified to work in Canada. To begin the official process of becoming an apprentice in Ontario, you must first apply to the Ontario College of Trades. Plumbing apprenticeships can take between two and five years and include on-the-job training (9,000 required hours) and in-school training (720 required hours). In order to complete the in-school training, which most plumbers-to-be do on a part-time basis, you must have an Ontario Secondary School Diploma (OSSD) with a grade 12 English credit in order in order to apply to a plumbing program. In some cases, you may need a math credit. These programs take two semesters or one academic year to complete. During this time, you will take courses such as plumbing tools and piping methods or welding and safety techniques, to name a few. Upon completion of your college courses, you will earn a plumbing certificate. However, you are not yet a licensed plumber until you complete both the on-the-job training portion of the apprenticeship, as well as a final exam. At the end of your apprenticeship, you will then take a three-hour exam. Upon successful completion, you will receive a Certificate of Qualification, which means you are officially a licensed plumber. If you are in need of more information about a plumbing career from real professionals in the industry, contact Advanced Plumbing, the most reputable plumbing company in Toronto.